The Ford Fairlane was an automobile model sold between 1955 and 1971 by the Ford Motor Company in North America. The name was taken from Henry Ford's estate, Fair Lane, near Dearborn, Michigan. Over time, the name referred to a number of different cars in different classes; the Fairlane was initially a full-size car but became a mid-size car from the 1962 model year. The mid-sized model spawned the Australian-built Fairlane in 1967, although it was considered a large car there. The Ford Fairlane was produced by the Ford motor company from 1955 through 1969. The original body design was the full sized Ford body which started out as a family vehicle and slowly evolved into many different available models and body styles. The exterior paint and trim options, seemed endless with elaborate cloth woven seat covers and a rainbow of paint combinations, you could virtually have any variety of Fairlane your heart desired. Variety was big in the early days which makes these cars somewhat more difficult to restore but all the more interesting to the collector. From 1955 through 1959 the Fairlanes were big and bold. 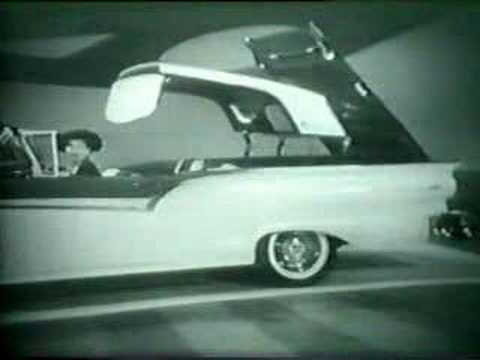 The 1957 introduced the very popular convertibles and retractables with folding tops into the trunk. These cars were available with a handful of engine options to include, the 223, 292, 332, and the powerful 352 Thunderbird V-8 with 300 horsepower. From 1960 to 1962, the Fairlanes began to decrease in size and went from a very large car to a mid sized car. The 1962 introduced some new styles to the Fairlane and were available with one of the first small block V-8 engines Ford ever built. The original 221 billed as "the world's first economy eight" eventually evolved into the 260, then 289 which has been used extensively with numerous changes since inception. The 1962 Fairlane began the first Fairlane sports coupe which continued through 1965. These Fairlanes were bigger than a Falcon, yet smaller than a Galaxie and offered the best of both worlds, solid performance, with great economy. The 1964 Fairlane body was also used to build the "Thunderbolt" Fairlane stuffed with 427 high riser V-8 engine designed for the drag strip. Only 54 of these rare birds were produced and are legendary in the Ford racing history books. In 1966, the Fairlane again changed to a new body style, this time, getting larger again than previous 62/65 models. Although not a full size, these Fairlanes were larger. The new dual stacked headlamp design was popular from the start. This boasted many available options and performance goodies to include, 427 dual carburetor engine setups, 4 speed manual transmissions, bucket seats, consoles and much more. The 1966 Fairlane was also produced in a fiberglass drag strip version with 427 power plant and stripped down racing accommodations. These were serious race machines. There were 57 two door Fairlanes with fiberglass hoods and 427 race engines that have been documented. 1966 also re-introduced the convertible Fairlane again which was available in GT, GTA, 500XL, and 500 models. The GT and GTA models were offered with more of the performance accessories most commonly built with 390 big block engines and bucket seat interior with console. The GTA referred to a GT with an automatic transmission where the GT indicated the car was equipped with a 4 speed on the floor. The 1967 models were very similar to the 1966 except for body side trim, emblems design, and interior patterns. One major advance in 1967 was the addition of disc brakes which replaced the drum brake systems of the previous year. The 1968/1969 Fairlanes were a new body style altogether. Depending on the model, the same body design was either called a Torino or a Fairlane. The lower end and mid range models were Fairlanes and the higher end GT models were designated as Torino GT models. The Fairlane Cobra, released for the first time in 1969 was the performance vehicle with standard equipment 428 Cobra Jet engine, 4 speed floor shifter, performance suspension, and bucket seats. This was a real screamer from day one and a very rare collector car of the present. As Ford began to phase in the Torino name in 1968 to replace the Fairlane, the Fairlane was still offered up through 1971 but in the only selected standard models. 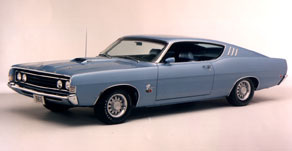 The 1970/1971 body style was a new style and shape which was commonly viewed as a Torino although Ford did use the Fairlane name on the lower end economy model.